If anyone got one of the enamel PJ shield pins I've got a few stickers for you. 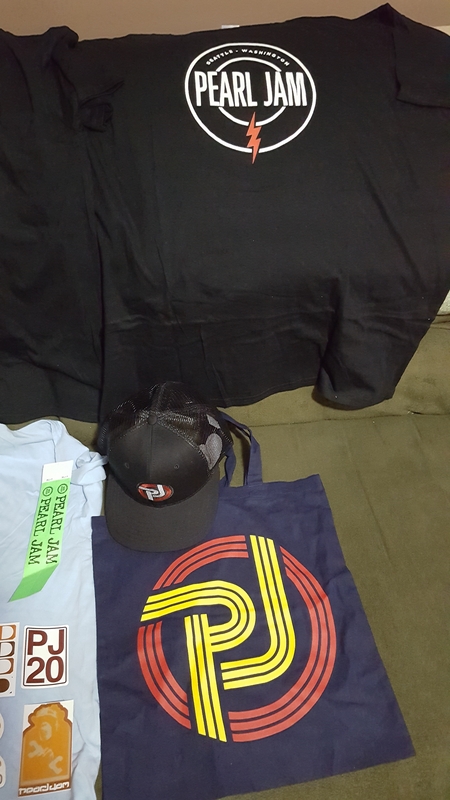 Haven't gotten my box yet, but would be interested in just about any hats (I already own the brown trucker) and most likely willing to part with any posters. If you received a Backspacer bouncy ball in your mystery box and are interested in letting it go PM me. I'd be willing to pay a couple/few bucks or so, plus shipping, for them. Or, trade some of my "smalls" such as stickers. PM me if interested... Thanks! 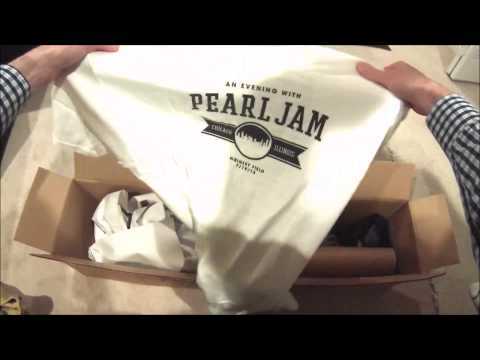 I got an XL Stockholm 2014 shirt (see below) in my box. I'd be willing to trade it for most of the other XL shirts I've seen people get so far (except for other Euro tour shirts). But if you got an NYC 2015 shirt (see below) in your box with which you're willing to part, I'd be even more happy to trade. 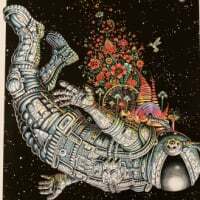 PM me if you want to work something out. Hat - 2016 NA tour. Top shirt - 2016 NA tour. Middle shirt - Milton Keynes, 2014. Bottom shirt - 2014 Euro tour. Ed Ved WA - sticker. Pin - Austin, TX. 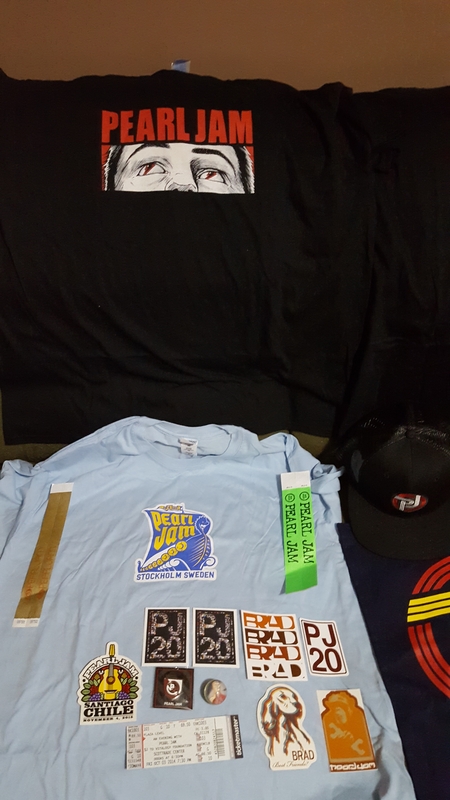 My mystery XL box contents here. 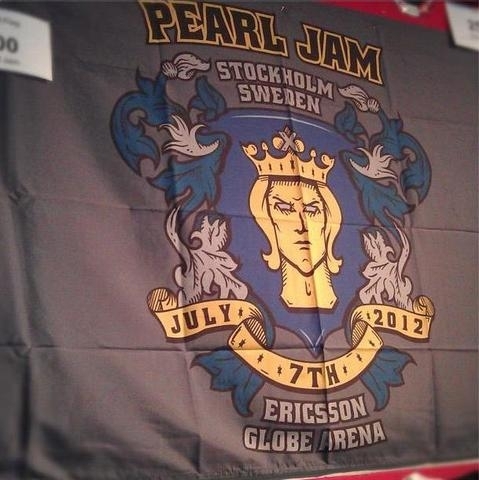 Only thing unavailable for trade is the Oslo poster. 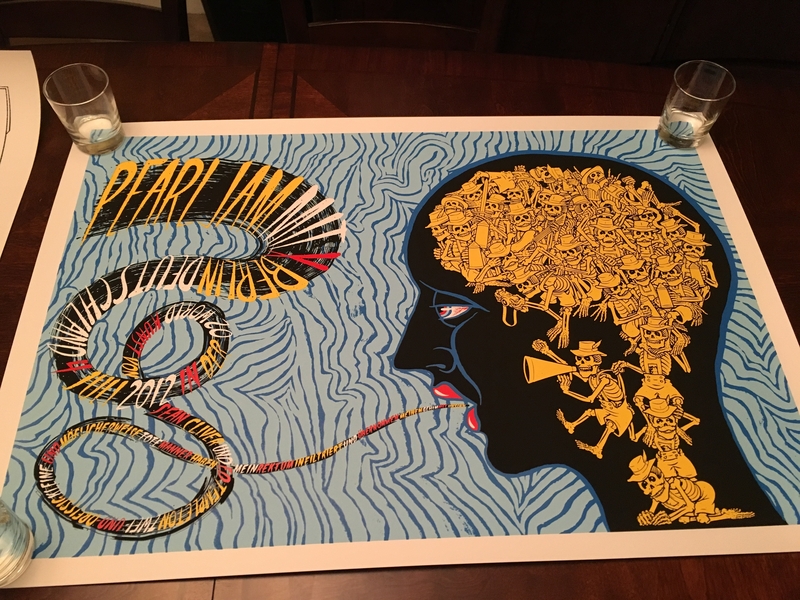 I'm especially looking for brown 2016 tour Trucker hat that so many others seem to have gotten, and believe it or not, the ugly Hartford 2013 purple ape poster (went to this show but didn't get the poster) and any PJ XL size hoodies. The light blue Stockholm tee I have in my mystery box does not have writing on the back (show specific shirt). The other 2 black XL tees do have the European 2014 tour dates on the back. The ticket stub is from 2014 Scottrade Center in October...doesn't say the city. Holler if you wanna make a deal. I promise I'm trustworthy. 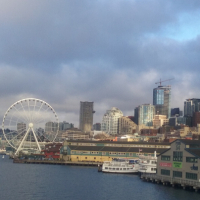 I've sold extra 10C tix to other members on here more than once. I'm open to all offers so shoot me a pm! Sorry, but I can't ship internationally...too expensive. 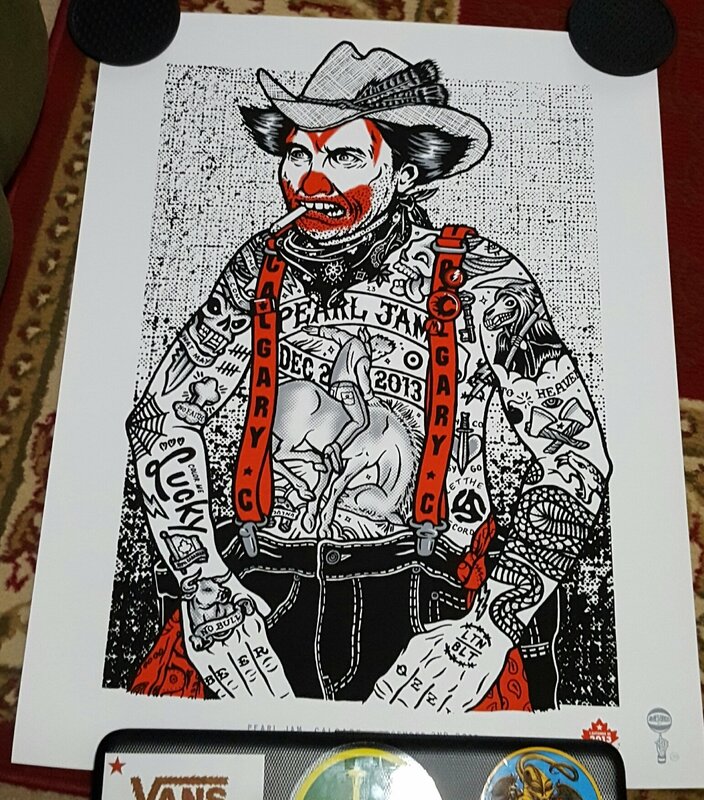 have the Manchester flag, Amsterdam poster, and the no clowns shirt for sale/trade. And got a cool yield sticker if someone needs that. 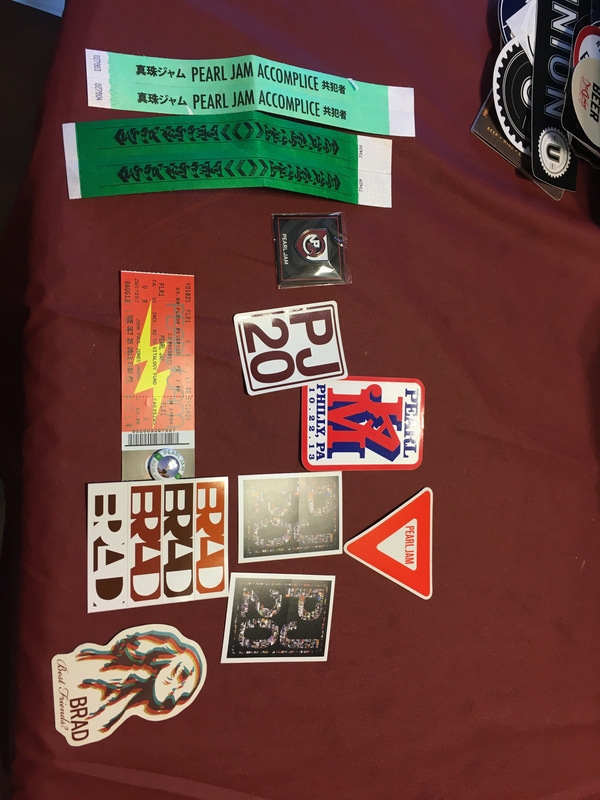 I will trade for pins, flags, road crew shirts, and the crasious stickman hoodie. Will also take wristbands and tickets for a collage my girl is making. PM me if you have any of those and want to work a trade. Thanks and best of luck to everybody on your mystery box hauls! Ticket is from Spokane, WA. Postcard pack contains all 4. Handbill is from 2003 advertising the Official Bootlegs. 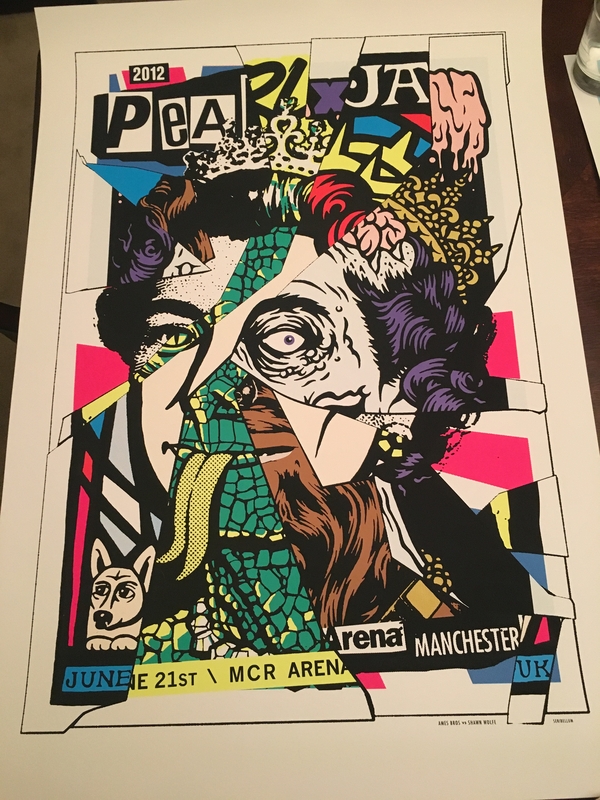 Handed out following the concert during the final leg of tour at certain cities. 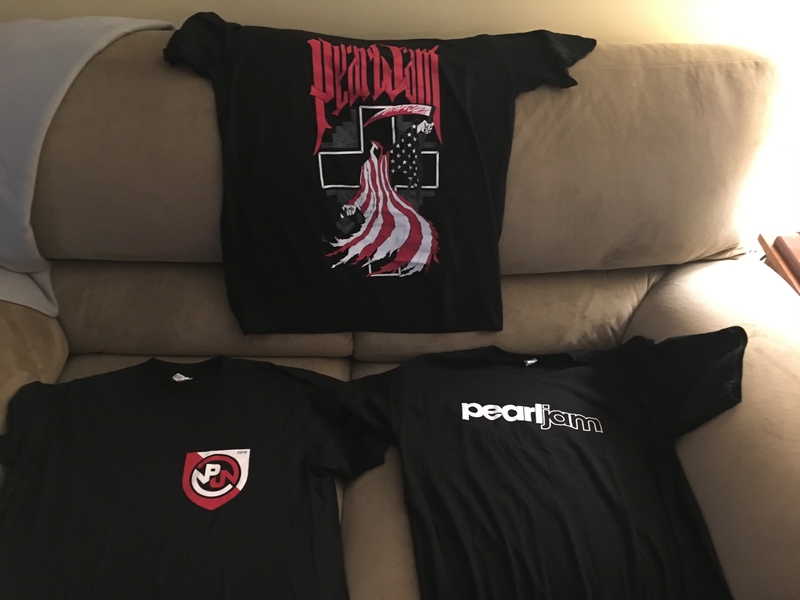 I still want a Global Citizen shirt, but I'm pretty sure that all of my Pearl Jam shirts are either show shirts or Halloween shirts. Oh, I also have a local crew shirt from the Riot Act tour. 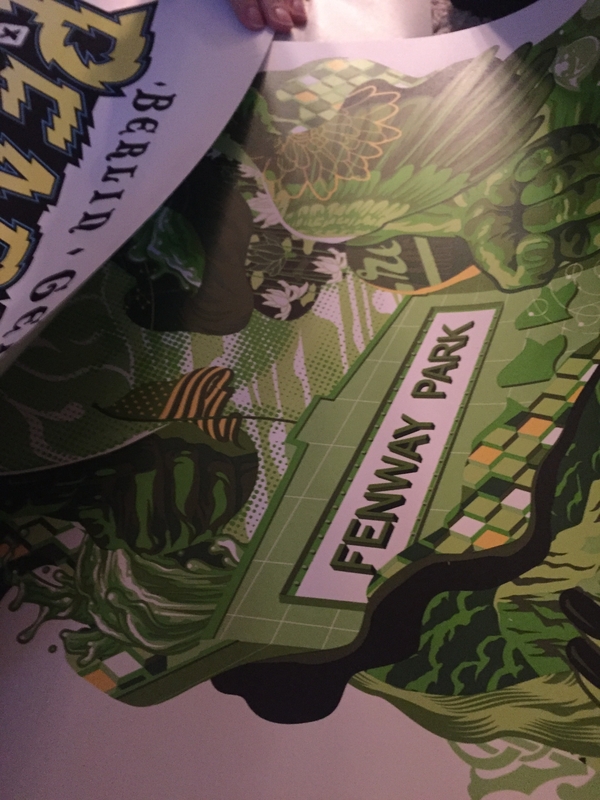 ISO for the Ames green monster variant. Please pm me if you have for trade. If anyone has any pj flags they don't want I'll pay your shipping to me, could throw in a few stickers too Thanks! Still looking to make a deal or two. My mystery box is an xl. Oslo poster is gone and Stockholm shirt is pending. Everything else available. The 2 black shirts I have pictured are European tour 2014 shirt that have cities listed on the back. I got the purple ape poster. I don't need any more posters or stickers and my size is L, so clothing probably won't work. Do you have any rare records to trade? Doesn't have to be PJ. I've seen quite a few Wrigley shirts...set list shirts I think. 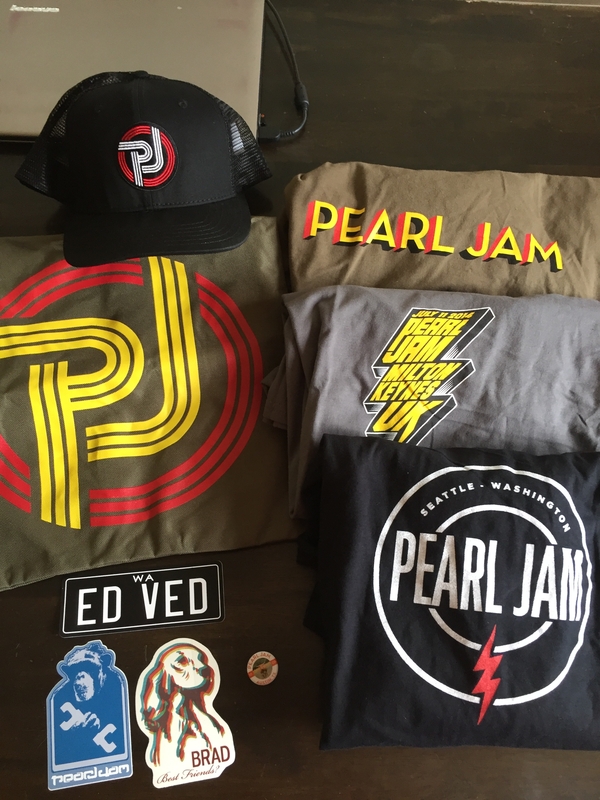 Anyone received a Boston set list t-shirt....? 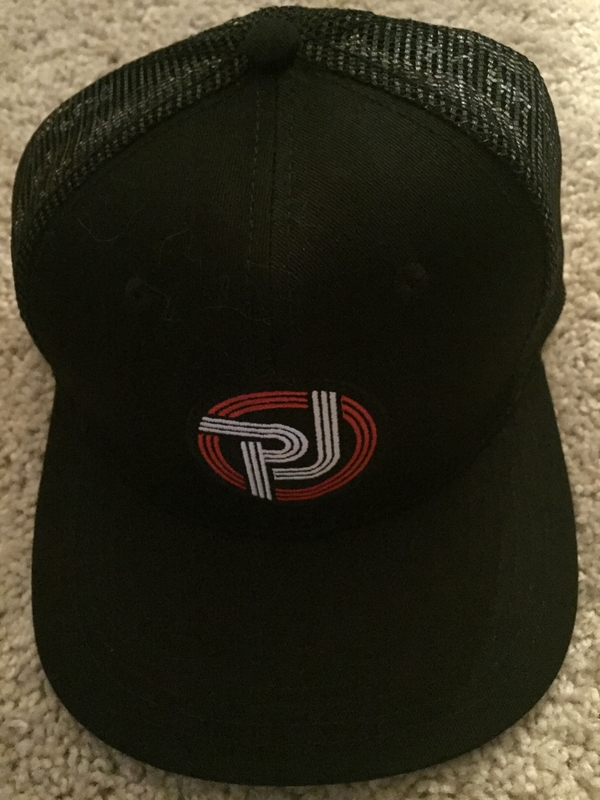 Looking to trade brown trucker hat for a large hoodie. Got my Men's Size L mystery box today. 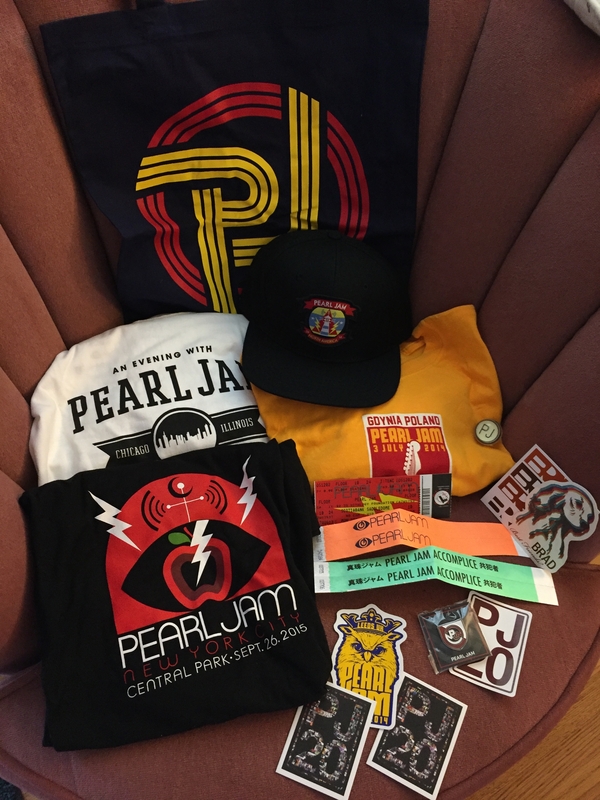 Included were: Gorge 2005 shirt, Wrigley 2013 Setlist Shirt, North America 2014 shirt, 2 Brad Stickers, 2 x PJ20 Stickers, Santiago Chile Show sticker from 2015, Pearl Jam 10 stickers, Backspacer Wristbands x 2, PJ20 Wristband, Barclays Center Show Ticket 2013, Austin 2012 button, Backspacer Bouncy Ball, Monkey Wrench sticker. 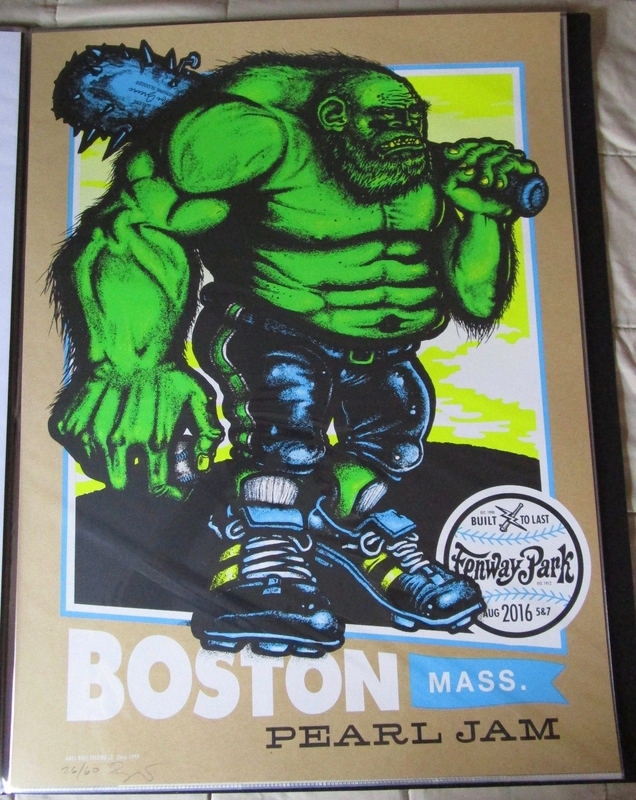 I also got the Fenway 2016 Green Lady show poster and the Ken Taylor Vancouver 2013 show poster. I'm open to trading anything but the Wrigley 2013 shirt. PM me with any interest. 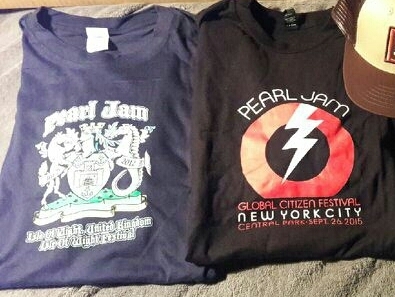 I'd like to trade my men's large Isle of Wight and Global Citizen/NYC shirts. ISO Shut up and Listen, KLOS radio station style or Fenway setlist shirt. 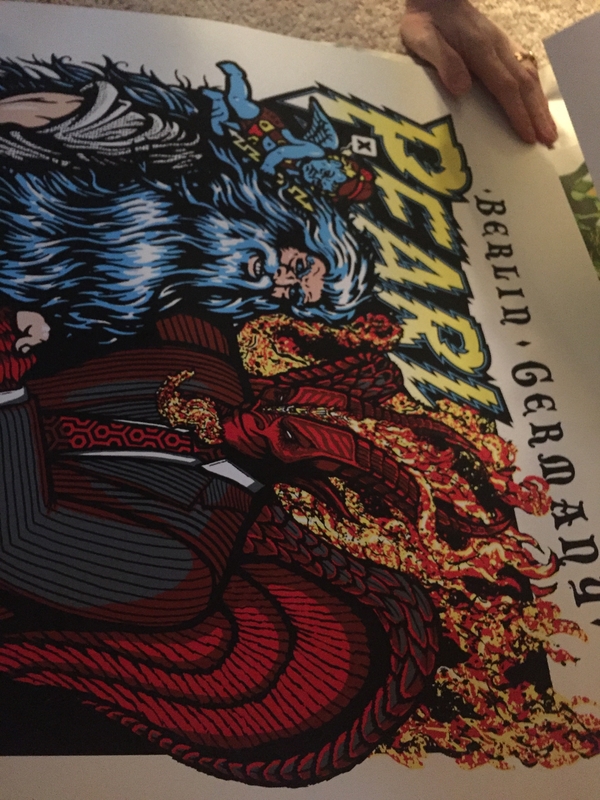 ft: my berlin flag for werchter or oslo flag. I'm pretty much a newbie on the forum and I'm kicking myself for not jumping on the mystery boxes in my size. How often are these offered? Once a year? Had no idea three shirts would be part of the box. I only have so many walls for posters and there's 7 days in a week so I was pleased to hear everyone getting shirts.